100 pack - 5-1/2x5-1/2x15/16" Medium Square Chocolate Brown Candy Trays fit our Medium Gift & Gourmet Boxes , Medium Gourmet Rigid Boxes , and Medium Gourmet Presentation Boxes . Trays have 16 sections. Complies with FDA regulations for food packaging. Candy packaging is made easy with these plastic candy trays! Easily give your candies an elegant presentation with our gold or chocolate trays! Each tray has separated compartments to keep candy and chocolates protected. Pair with one of our window presentation boxes for a quick and beautiful package! Use our candy cups and candy pads to build layers and for added protection for your treats! 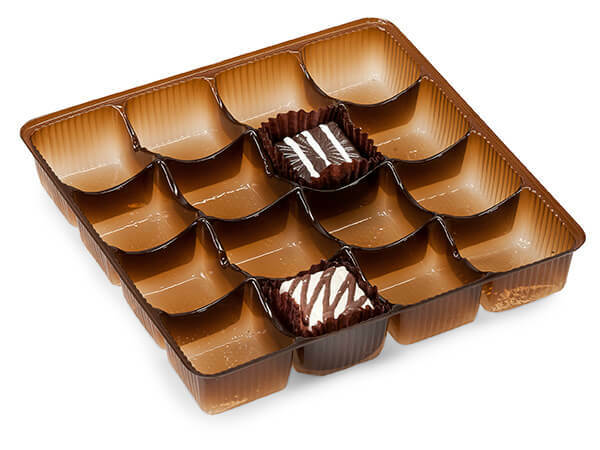 All candy trays comply with FDA regulations for food packaging.